This place seems not to remember hours ago when it was making me trundle through slush covered streets and crying for lack of a menu. It is bright and sunny and not a hint of snow. 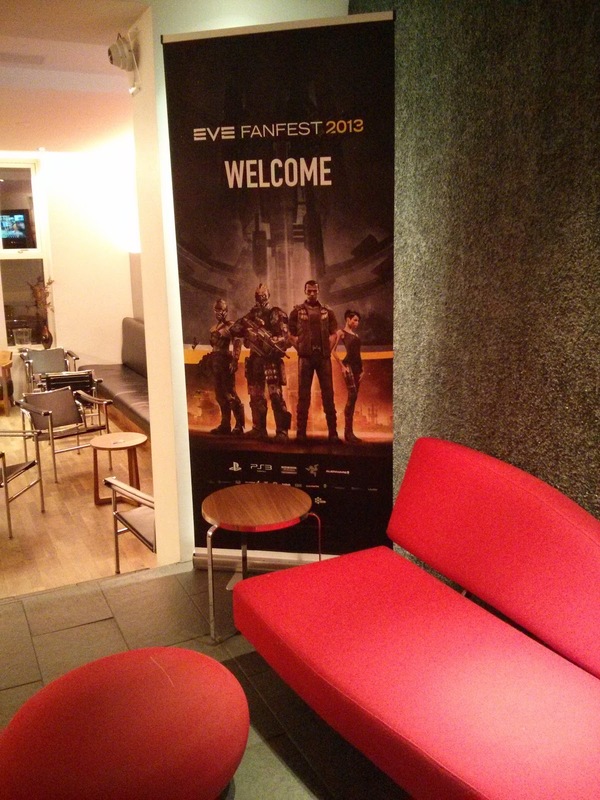 There is Eve stuff everywhere. There are businesses with Eve focused ads for drinks and foods. 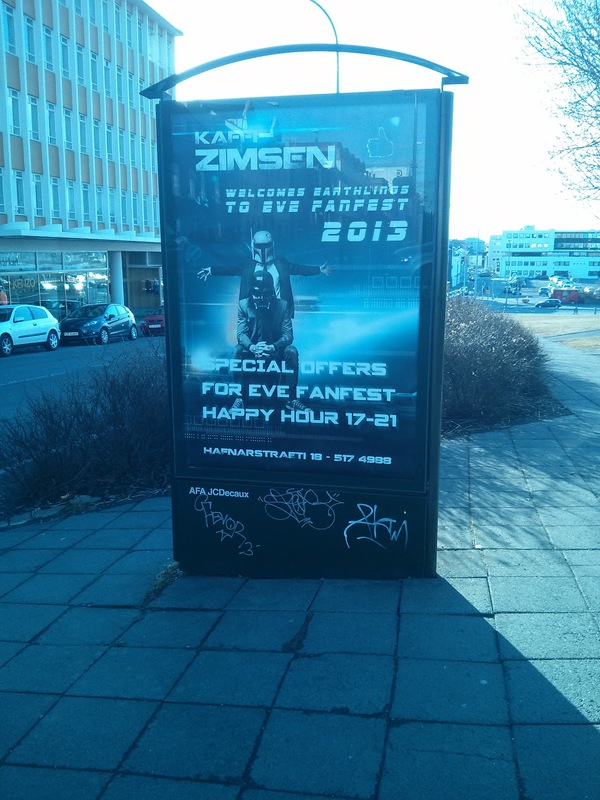 Welcome Eve Fanfest posters at the hotel and the street. 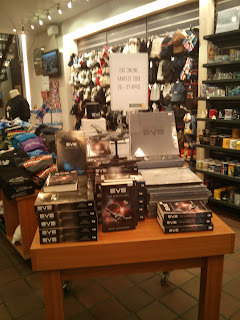 The bookstore has a display up for Eve as well. It was very nice. While taking one picture two gentlemen engaged my \husband in conversation about how cool Eve was. He nodded vaguely and I, ignored and taking the pictures found myself amused as they go, "Yes another Eve player!" and head off on their own adventures. After that I went back to the hotel, feeling a bit more sane now that I had power. I showered and dressed and headed off to the Celtic Cross to see about the whole #tweetfleet meet thing. That ended with me standing outside of the building and staring at its packed interior, turning around, and walking off. Maybe I will get to meet someone tomorrow. My big mistake was not in making any definite plans. Going, "I'll go and talk to people and see how it goes," was a rather stupid thought for me. I've never succeeded in inviting myself to things other people are doing. As I passed the groups of Eve players chattering happily with each other I could have kicked myself for not having plans. But, I don't have corporation or alliance mates and those I do know are busy with social gatherings. I will still pack my chocolate tomorrow and wear my new Awake Chocolate shirt and see how that goes. It is good to see so many players floating around. The overall mood is very happy and cheerful. 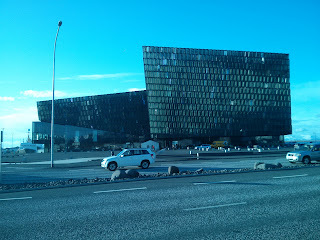 The Harpa place is very pretty and truly right across the street. I can see it from the corner of my window and it is the main view out of the front of the hotel. The landscape is a bit flat. 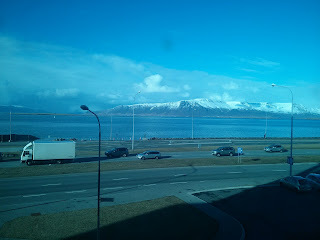 To one side, snow capped hill(? )like things. To the other the city which is growing considering all of the construction. I managed to trip over the uneven brickwork quite often in my nicer shoes. My others were still wet from the snow during the morning. Dinner was at a Argentina Steakhouse called Argentina Steakhouse (as far as I can tell). It was down this little walkaway with uncovered trusses that appeared to be descending into the dark. At its end was a wooden wall with a door matching the wall inset into it. I stared at the door. It seems that you are just supposed to open it and step in to suddenly restaurant. It was a nice place, cozy. I think its the type of cozy that other people translate into romantic. There is no romance in my soul so it was just a bit dark and made photographing the food something that wasn't going to happen. The food was amazing. The salad was rocket. I thought I had escaped that when I left England and I could not find a head of iceburg or romaine lettuce anywhere. But, it seems that salad equals rocket in Iceland as well. Nighttime is gorgeous The sunset, supposedly at 2130 but it is not a fast sunset. At 2300 the sky was a series of bands from the deepest of midnight to a glorious royal blue trimmed in a band of gold on the opposite horizon. Even now, at midnight there is still a glimmer of light on the horizon that softens everything into the muted cool depths of blue. There are a lot of bars here in the center of the town. The crowds were not crazy rowdy as they poured in and out of them. I have no experience with bars. But, they seem quite popular and more common than places to find food. I keep having issues with crossing the street where I wait for the car to pass and the car stops and waits for me, making me feel like a jerk. I'm used to the land of run you down and honk that you had the nerve to waste their time with your walking. It is an odd contrast to how aggressive the drivers are with other cars. I also have the impression that the crime rate is not quite as high as I am used to as the norm. At the front door, which was a bit out of the way of the actual dining area of the place where I ate, people just hung their coats up on the coat rack. Passing a place being renovated, tools had been left out for the night. I'm going to assume at 2300 hours they are no longer on site working. Shops leave their doors open with no chimes and people left their desks and registers with a note that they would be back. It is a stark place with a raw attractiveness to it. The sky is such a searingly bright and clear blue. 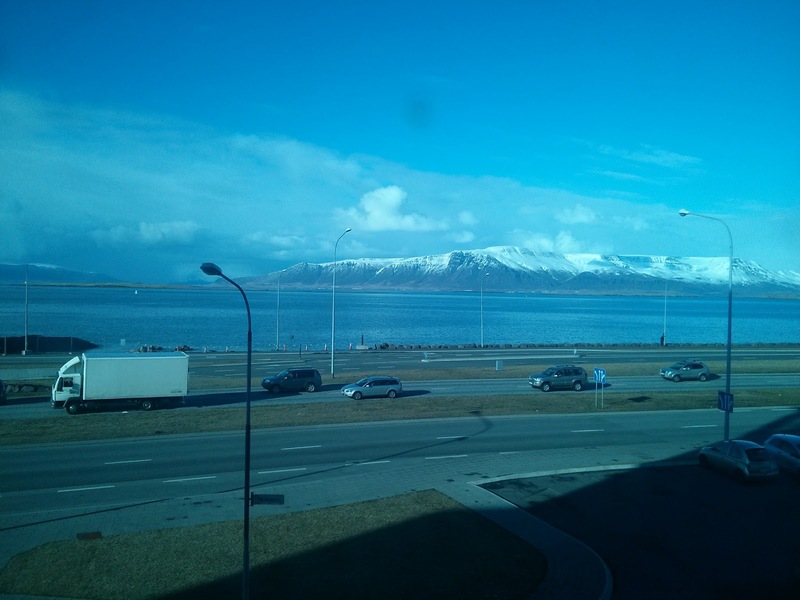 Iceland definitely has a low crime rate. "Here, take the keys of my van and drive yourself to Reykavik, I will stay here. Just drop the van at this address." Huh? I am just a random stranger from overseas, why did he trust me with his van? Well, it was not like I could steal it on an island but I still felt weird. Same with houses: I rarely found people locking their houses when leaving (at least outside of the city).